It has been a delight to work on a project close to home recently which encourages two generations in the local community to come together. Working with the wonderful McCarthy & Stone team – a housebuilder with developments across the country – we have been overseeing their intergenerational living initiative, which aims to enrich the quality of life of their homeowners. All while lending a helping hand to the children and staff of Sherborne Abbey Primary School. 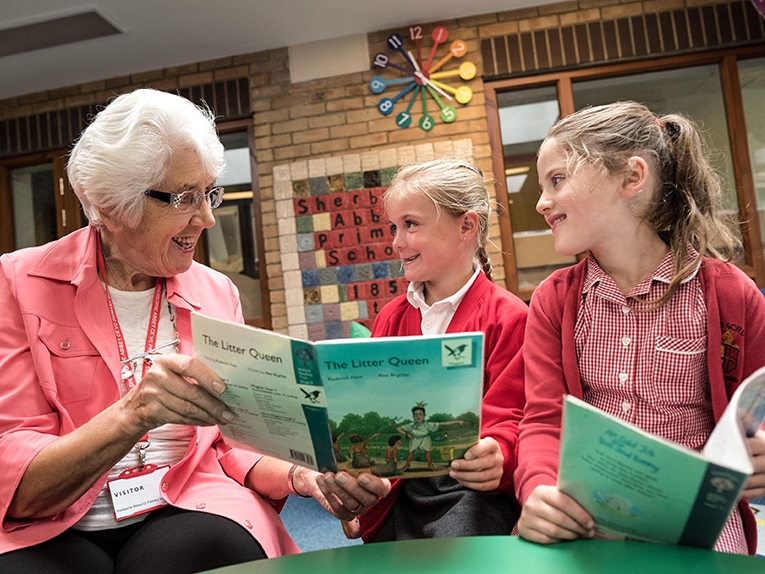 Launched this September, the intergenerational project sees homeowners volunteer helping primary-aged children with reading, writing and sometimes music too. Introduced in Sherborne as a pilot scheme, McCarthy & Stone’s aim is to encourage homeowners across the country to volunteer at their local school or nursery, as research shows there are huge benefits of older generations regularly spending time with children on mental and physical health, as well as the wider advantages within communities. A fabulous opportunity for generations to learn, teach and be inspired by each other, we went along to the school to catch a glimpse of the homeowners in action, and collect some footage and photographs for two additional McCarthy & Stone projects – a corporate video and the third edition of Emerald magazine – launching soon. We’re extremely excited to see the project grow and the positive results it has on the homeowners, children and schools in Sherborne and beyond!